had the opportunity to travel to Manila to consult with the Philippine government on housing for low-income families. 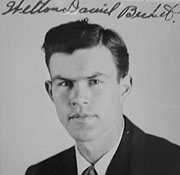 Becket was born and started his career in Seattle. He designed the original Los Angeles airport and many homes for Hollywood stars such as: James Cagney, Ceasar Romero and Robert Montgomery. 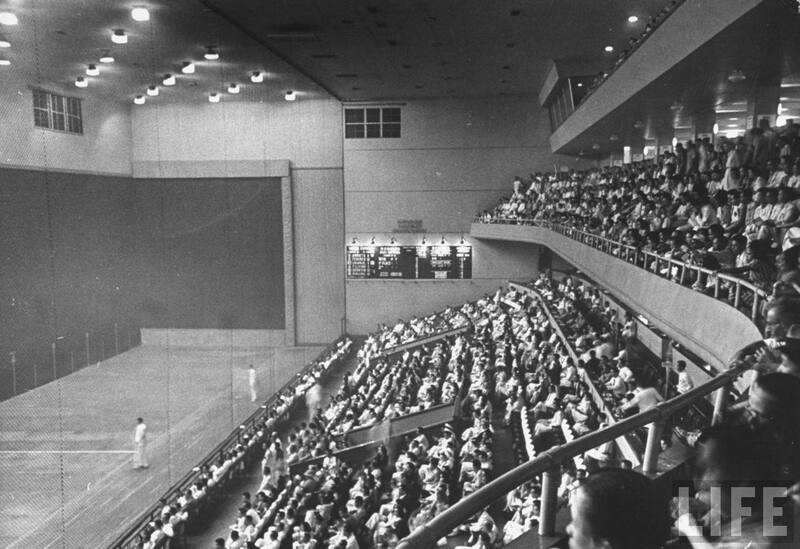 After leaving for a three-month stay, Becket landed a $1,000,000 commission to design a new Jai Alai Auditorium in Manila. 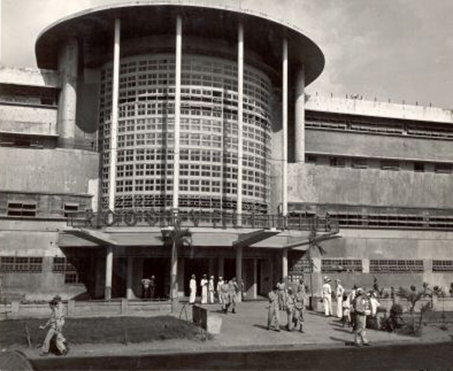 The Manila fronton was erected in 1939 and with its sleek and streamlined design fashionable in the 1930s, the structure soon became an icon. The games were formally inaugurated on October 17, 1940 by a team of Basque pelotaris and became an instant hit with Manila’s elite. It slowly evolved into an exclusive sport for the rich, much like golf. 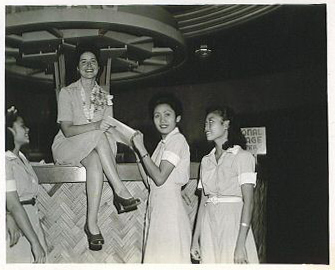 Adjacent to the old Congress building along Taft Avenue, the Jai Alai Club soon became the place to see and be seen. 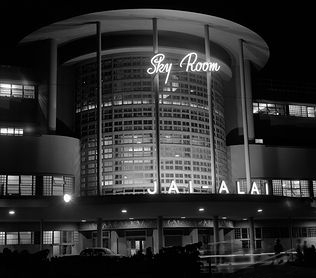 The four story building was said to be one of the most beautiful Jai Alai frontons in the world, complete with gaming rooms, 4 restaurants, 4 bars, a roof garden and imported Spanish and Filipino entertainers. The large playing court filled one side of the huge building. The vocal spectators watched on three levels behind a glass wall that lined on one end of the court. Dinner and cocktails were available at the top floor in the glass-enclosed and very airconditioned dining room called the Sky Room. My parents would take me every so often to the Sky Room where I would relish the fact that I could “almost” wear a sweater and order a wonderful T-bone steak. Mmm!! 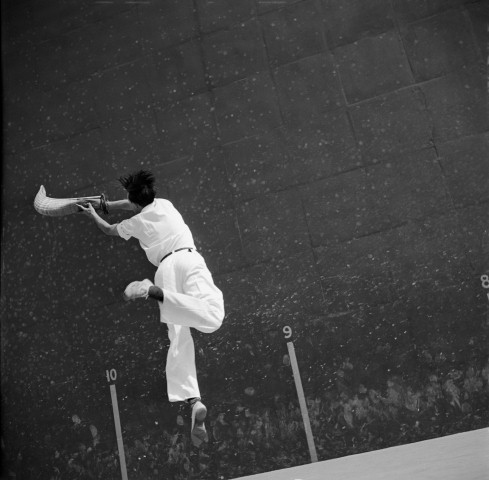 Jai Alai – means “happy feast” in Basque, the game was initially the sport of Manila’s elite. According to some sources, the game was introduced to the Philippines in 1899 by a group of aficionados headed by the Elizalde brothers. Every night, the fabulously wealthy or the heavily indebted visited the Jai Alai Club and gambled on the crooked play of the imported Spanish Basques. Well, most people would agree that the games were fixed. Those stories abounded just like the boxing and wrestling competitions of the day – it was, after all, entertainment. Jai Alai is a very competitive and sometimes, very dangerous sport played in a three-sided court similar to a handball or racquetball court, only much larger, one hundred eighty feet long, fifty-five feet wide and eighty feet high. The game is played with wicket basket-like slings that are attached to one hand of the players. Using these baskets, the players are able to throw the hard sheephide ball at speeds that defy the imagination. The ball is allowed to play off the floor and walls but not the ceiling. Most of the Jai Alai players were originally Basques from Northern Spain. Tough, fearless men who played the game with total abandon. The Jai Alai building had seen many uses through its lifetime. 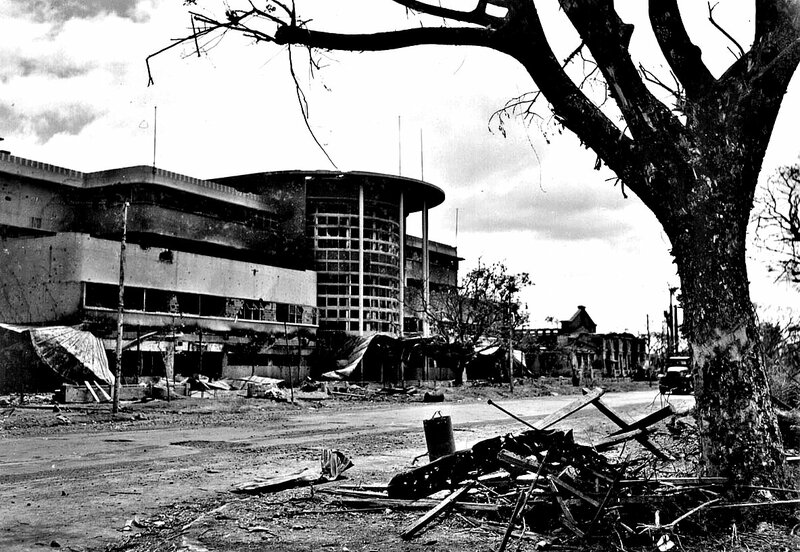 The Jai Alai palace was the only major structure in Manila to stand up under both the Japanese and American bombings. It was constructed so strongly and served so well as a shelter during air raids that it was used by the top staffs of both the American and Japanese Armies when they were in Manila. During the Japanese raids against Manila’s “Open City” at the end of 1941, the Jai Alai building was set up as a makeshift hospital and morgue by the U.S. Navy. When the Japanese marched into Manila in January 1942, they found transmission equipment hidden within the Jai Alai fronton that had been used by the underground resistance to communicate with the military defense on Corregidor and Bataan. During the Japanese occupation it was the headquarters of the Japanese military secret police and a place of dread to all the remaining citizens of the capital city. 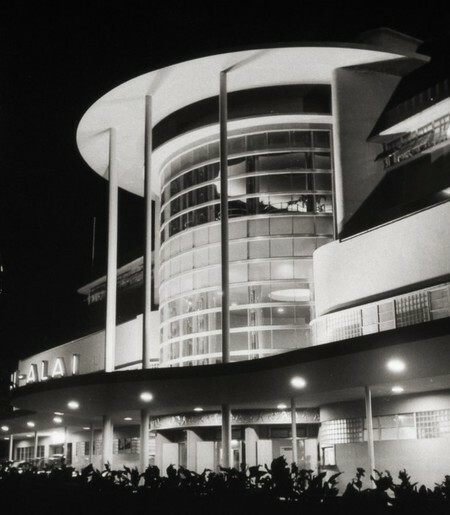 After the war, the Jai Alai building was the first badly damaged spot to be restored to its pre-war state. Cost of the $500,000 reconstruction was partially paid by the U.S. Army led by Charles Ward who drew the plans for the service center. With the help of 1700 Filipinos, the Army and the Red Cross directed the reconstruction. It was renamed The Roosevelt Club, after the late president, and was said to be the largest Red Cross service center in the world. It served about 40,000 military daily with every facility that can be offered by a first class hotel. The fourth floor was outfitted for the entertainment of the servicemen with a canteen, jukebox, cabaret, broadcasting studio, valet shop and phonograph studio. 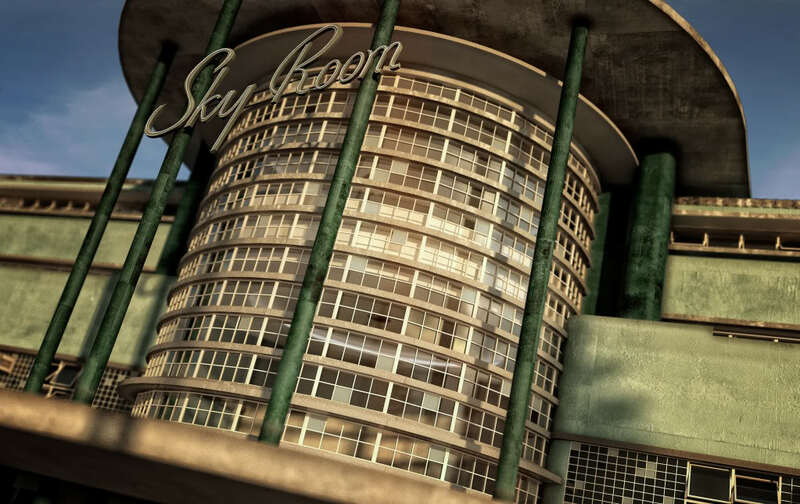 The floor also had a roof garden, solarium, auxiliary dance floor and a soft drink bar where the famous Sky Room formerly entertained hundreds every night with big name bands, featured artists and the finest food and liquor found in Manila. Red Cross “girls” ready to serve. The tremendous fronton where the best jai alai players appeared was converted to a huge dance floor and a theater seating 5000. A service bureau, coffee shop, barbershop, checkroom, restrooms, first-aid station, lockers and showers were located on the first floor. Unfortunately, the building did not survive the post-war years, decaying to a sadly abandoned structure and was demolished in 2000 – defying preservationists who rallied to save the building, one of the finest examples of Art Deco architecture in Asia. The spirited campaign to save the building was ignored by former Manila Mayor Lito Atienza, who decried the structure as a reminder of gambling and other vices, despite the presence of numerous government-owned casinos in the city. 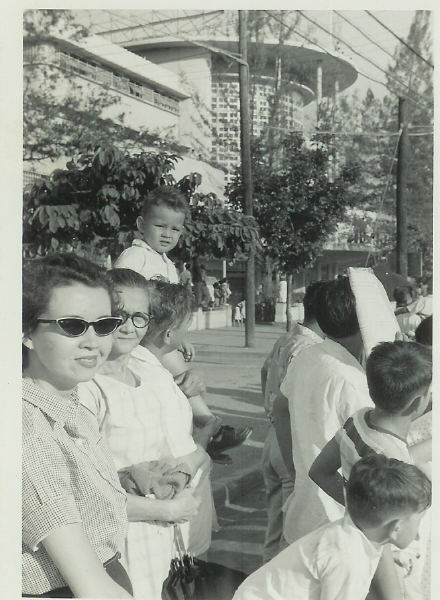 Here’s a photo of my Tita Charito and her mother, Adelaida apparently waiting for a parade to go by on Taft Avenue past the Jai Alai building. Tita Charito Oppus and her mom, Adelaida. Here are a couple of wonderful digital paintings by Edel Rosario. They bring to mind the essence of the Jai Alai Building and perhaps how it might have looked today had it been saved. Sayang ! Digital painting by Edel Rosario. Next time: Hmmmm…. the Metropolitan ? 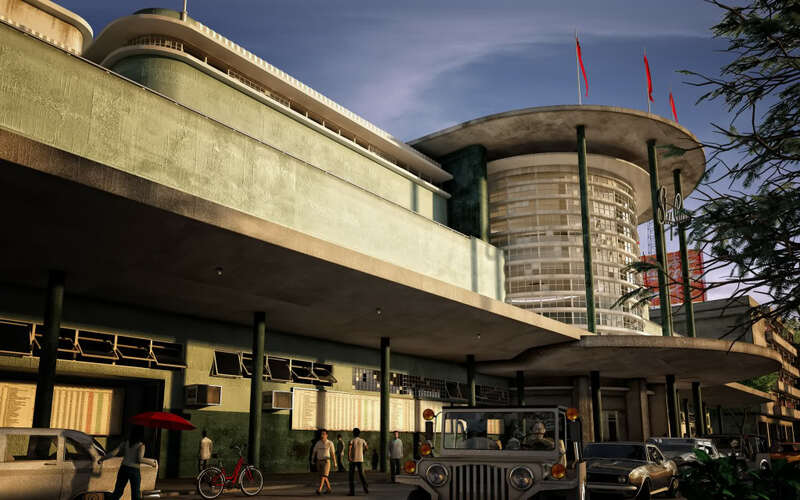 51 Responses to The Jai Alai Building, a beautiful example of Art Deco in Asia. I hadn’t realized the building was destroyed so recently. What a shame, it really was unique. But…that’s the Philippines! Love, your biggest fan! I have the black and white picture of the Jai Alai mounted as a poster in my guest room here in Florida. I have an emotional attachment to the Jai Alai building as it has been a prominent fixture of different important events in my parents’ life as welll as mine. I found the poster in the ALL Posters website. But this site is wonderful as we can revisit the beautiful old city of Manila that we knew and loved. Thank you Lea. It was rather special wasn’t it ? Did you go to the American School while you were there ? Brings back memories. I remember at the ground floor is a game arcade (precursor to the video game shops) where you can play pinballs etc. My favorite is the submarine torpedo game trying to sink ships. This is around 1970. I used to visit the Manila Jai-Alai may time in 1979 when I visited Manila. A real shame the building is destroyed. I can never forgive the Mayor that destroyed the building that survived war. Every time i see the trash and rubbish on that sad lot i feel very sad. It was such an elegant place… Always a thrill to go up to the formal dinning room upstairs from where you could dine and look down at the games through glass panes. You were not allowed in without a coat and tie, which you could “borrow” from the establishment if you madr the mistake of trying to enter not properly attired… This was the elegant and classy era of the Philippines… What a joy!!! A friend from High School introduced me to Jai-Alai when I was in pre-med. have been preserved as a landmark. Thank you to whoever posted this!!! It was definitely a crime to demolish that beautiful building. You’re welcome. Perhaps when people are made aware of the senseless destruction of our heritage, they may rethink tearing down a beautiful landmark for a parking lot when it could still be preserved and restored. I hope work continues to save the Metropolitan Theater and the beautiful Luneta Hotel. Look at all the one-of-a-kind examples of art deco architecture in the theaters like the Ideal, Capitol, Lyric, State and Avenue theater. Rizal Avenue looks horrible with the elevated rail structures. Why is there no creative urban planning ? Let’s strive for a more beautiful Manila – it can be done. I really admired you for posting all these precious photos of Manila. Im a Filipino and it really makes me so proud seeing all these memories.. i was born 1980 and i dont know about all of these memories.. Are you a Filipino also? Thank you Jan. I am a mestizo born in Sampaloc in 1945. I left Manila in 1962 to live in the U.S. And now live in Seattle. As you can tell, I hold very many dear memories of Manila. I came across your site while researching about Manila, as I have been in Love with that Place, since I pent a decade or so way back in the 70s and 80s, and Visited Manila couple of times in the last 10 years, and I am shocked to see the Many Icons of Manila fading away, Yes I am saddened, Maybe this the price of progress we have to pay, But the Romantic in me still cannot accept to see the change, I would not mind changing other parts of Metro Manila, but the Historic Place of Manila should be preserved, Thanks a Ton for sharing. Parang ang mga namumunong Pilipino walang sense of history. Lahat na magbibigay alaala sa nakalipas gustong i demolish, kaya ang akala ng mga kabataan, wala tayong pinagmulang maganda… kasi ang kasalukuyang nakikita na lamang ay ang mga makeshift barong-barong na nakakalat kahit sa mga lugar na pinupuntahan ng mga tourists. Hay, buhay. Sa Polillo, Quezon, mayroon doong simbahan na ginawa noong panahon ng Kastila, pero, mga ilang panahon ang nakalipas.. siguro in the 1970’s idenimolish ito at tinayuan ng kasalukuyang simbahan. Napakatibay raw ng winasak na lumang simbahan, parang ang pagkagawa ay hinaluan ng lupa ng dagat kasi may mga shells. Sayang na sayang kasi ito’y kasaysayan, ito’y ating nakalipas, ito’y ating yaman… ginamitan ng yaman ng dagat at ito ay nasa alaala na lamang ng mga nakakita, paano na ang hindi nakakita? Sad to say, but our leaders are bent more on preserving their political dynasty rather than preserving the richness of our cultural heritage. Making money is now the rule of the day. Monuments no longer count. Real estate values are just too tempting. Sad that many of our officials do not have a sense of history. But thanks to you, Lou, we do get history lessons. Thanks for preserving this building online…for that is all that is left of it. What a shame our developers didn’t appreciate it as much. I remember this building very well. When I was young, our family would usually go to Manila to do some shopping at Carriedo in the late 70s/early 80s and the bus usually stops here or at Plaza Lawton. At the back of this great building is Adamson University. Unfortunately, local governments are short sighted – this place could have been a commercial center and still retain the external frontage. A big factor that Manila became so ugly now is also because of the construction of the LRT in the 80s. Just saw the pictures of the Jai Alai Building. What a shame it was torn down. When I was a kid I sometimes played with Lito Atienza, who is a first cousin of a first cousin. The destruction of the building was the worst thing he did as mayor of Manila. The excuse that it was a house of sin was just for the public. I suspect a huge amount of money was involved to provide the area for a new building. Now, Peping Cojuangco (Cory Aquino’s brother) as president of the Philippine Olympic Committee, wants to sell the Rizal Memorial Sports Complex and make the area available for malls and high rise buildings! At least Rome has its ruins. Manila won’t have even that to remind people of its glorious past. Keep up the great work Lou! I was born in ’55 therefore my memories are more from the 60’s. My siblings and I all grew up in Horseshoe, New Manila but all six boys went to that green and great school on Taft Avenue. Our lunches were at our grand parents house on Florida St., Malate. As a kid I used to be mesmerized by the bright and beautifully colored fruits of San Andres market. Every chance I had to ride the family car, I took. Taft Ave. was the Jai Alai building, WHO, PGH, PWU, Agrifina Circle and of course La Salle and the Palanca residence further down. To and from school we would take Sta Mesa and pass by (of course) DRB and Stop & Shop. Our groceries were delivered at home then by the green model’48 Chevy trucks of Acme Supermarket. I used to take our mother to her ‘luncheons’ at Madrid restaurant on Hi-Way 54, shopping at Aguinaldo’s in Cubao and Rustan’s in San Marcelino. Ysmael Steel would have their sprawling grounds with a huge robot in Quezon City. It was wow! Luneta was watching Independence Day parades, buying pink popcorn, balloons, and cotton candy as the double deckers waited for passengers. You could see water splashing by the breakwaters of Manila bay along Dewey Blvd. and many many more. Last but not the least was Holiday theater on Aurora Blvd which would give candies as change. The wonder years! Thanks for sharing! I had forgotten about those green Acme trucks. What a flashback! Ligon? Are you from SBC HS 60? I am too. I was very lucky to be born in the 60’s. I was able to experience these great architectural landmarks that the 60&70’s administration tried to preserve. I was very lucky to have been able to enjoy Manila as a boy. Needless to say I went to the best school . As every knows Christian Brother on Taft. I lived on Dagonoy & Taft and school was across the Street. I will never forget the Brothers. My favorites were Bro. Adolf who would give us a violin recital if we behaved. Bro Anthony 2nd grade the only one to have escaped death. most of the families in our old neighbor did not survive the Feb liberation. We came to the States, as soon as we could in Late 1945. First to New York City and finally to San Francisco. Too bad Manila has changed so much. We had it all, good worker, English was spoken, We had one of the ten top Airlines, Don Andess Sorian ran PAL. We had a very good Maritime fleet. We have lost it all – we are now below most of the countries in Asia. You are right! We have lost it all…due to greediness courtesy of our politicians..that was after 2nd world war…hindi na tayo nakaahon…anyway thanks for sharing your wonderful recollections of the glorious past of our beloved Philippines. Left handed pelotari? He must have had an edge though because it should be a cinch for him to hit the double wall shots every time. I was past member of the Amateur Pelotaris that practices in Jai-Alai. Never was good at it though. Just good in betting :-). I actually predicted correctly the big time win of Antonio – a derecho, we call it I think. Very good post. I would like to trasnlate it to Spanish and publise in our web site, of course mencionating the origin and linking here. ¿Are you agree? Along with my mom and my dad we used to dine in a resto inside that building when i was still a kid. If Shanghai can preserve their art deco buildings, why can’t the Filipinos do the same? Preservation and restoration of historic building and landmark reflects who we are and what we have been through. It’s sad that nothing is being done to restore these masterpiece of works created by Filipinos. Sa mga engineers, architects, at construction, magastos at lugi. At sa masang Pilipino na karamihan either walang pinag-aralan o di nakatapos and ergo mahihirap, ang kultura at kasaysayan ay hindi nakakain at nakakapawi ng gutom at kahirapan. Those commentaries above really causes pain. 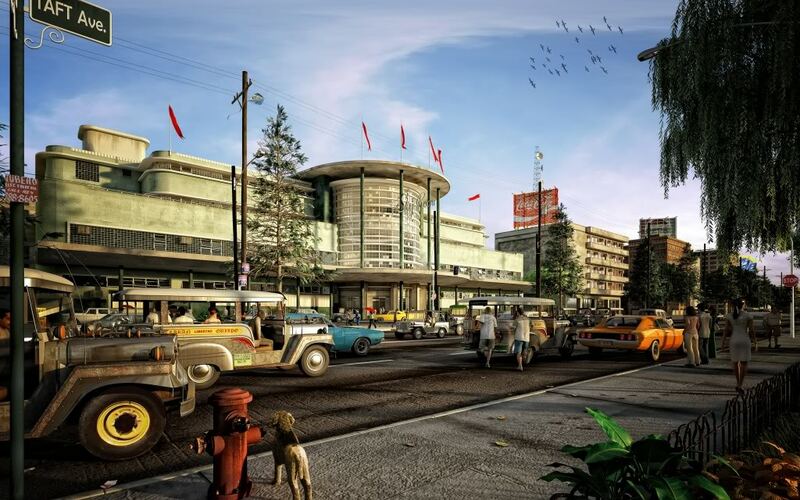 For everyone born in the 40’s, 50’s and 60’s, one would appreciate what Manila was then compared to Manila now. Take the jeepneys, in the 50’s and 60’s there were the TPUs (11 passengers including driver) and the ACs (9 passengers including the driver). Fare was 10 centavos. We studied at La Salle Taft and our home then was in Balintawak. Our houseboy then, would bring us lunch and wait for us until dismissal at 3 and we would take public transport to go home. Our dad would only pick us up from school on Fridays which automatically meant, having dinner in Plaza Santa Cruz at Moderna or Wah Nam (correct me if I am wrong) and two movies either at Capitol and Lyric or any two movies along Rizal Avenue. I remember meeting some of my classmates at the movies and when we came back to school on a Monday, we would still talk about the movie that we saw Friday night. We would encourage our other classmates to see that particular movie. During that time, the Jai-Alai building was the most beautiful building on that part of Taft Avenue. I remember the Radio Center building next to the fronton, a Lambretta or Vespa scooter showroom next to it and the passageway going to Adamson University. Manila now with its MRT or LRT whatever you call it spoiled the beauty of Manila half a century ago. What a pity! I love reading your post because it brings back memories. I must admit though that I was not yet born (I was born in 1967) during most of the times you mentioned in your post. But I can relate nonetheless because I have seen most of the places you mentioned here when I was much older then, but these places were not the same as before as described in your posts. I have seen Jai Alai when it was still standing but it was already decrepit. I have strolled along Escolta and watched at Capitol then and shopped at Syvel’s but the street was already past its glorious days. I was actually born in Tondo. So, I would appreciate if you could please include Tondo in your next posts. I am Spanish born in Manila on 1958, my father was a Spanish pelotari player Mario Garrote Bisquert, from the 50’s till late 7o’s. Still remember watching their practice on morning Saturdays, drink some milk shakes on Sky Room. Last time I visited Jai Alai was on 1986 and meet some veteran Spanish players, they where very glad to see me. I feel sorry to know about the demolished and think about my remembrance and feelings of this special place for me. I remember the Jai Alai bldg. very well since I studied in Adamson University in the early 1990s. I actually made the Jai Alai my reference for disembarking from buses that ply the Lawton area. During that time the building was already in a sorry state but you can still see its grandness. How I wished it was preserved, it was one of the most notable art deco buildings in Manila. I used to play cesta punta as an amateur at this fronton, and also pala pelota at casino espanol. most times , would skip classes in school at San Beda. had lots of “chick fans” back then….loved the game! I’m so glad I saw this post on Jai-Alai. 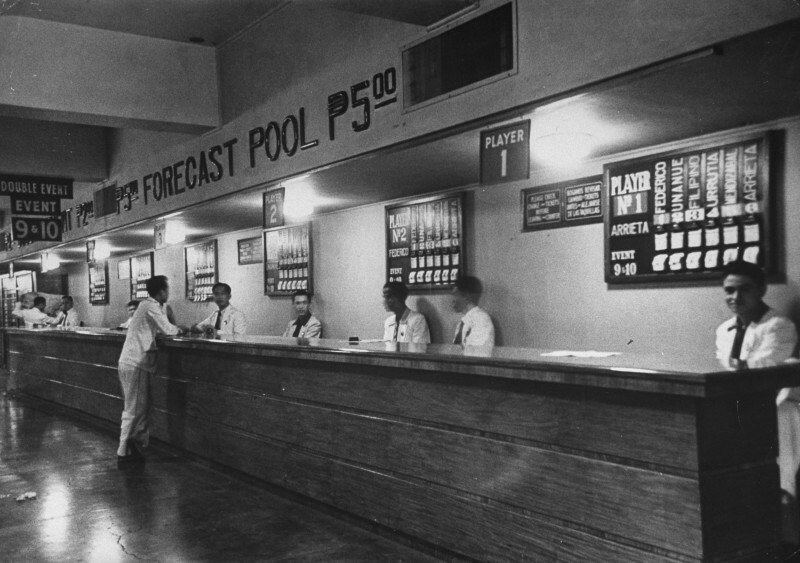 I had that nostalgic feeling as a go over these fotos especially the betting booth practically imagining myself standing there sometime in the late 60s and early 70s placing my P2 bet on my favorite player-combination Manileno and Antonio for double. Yes they were my favorite pelotaris…..but more on Manileno and how I wish I could meet Manileno personally. If anyone knows his number or address, I would highly appreciate if you could send it to me…..i never had the chance to tell him during those days how much we idolized his skill in this sport. My beloved dad worked at Sky Room all his life. Every New Years Eve was a party to remember. All holiday and private parties bar none. Professional etiquette at its best. Undeniably the place to be 1960s – mid 70s. Watched great pelotaris Oyarzabal-Manu-Iniaki etc. Walked across Luneta Park everyday for fresh air. Life as it should be : keeping it simple. Thanks to the Madrigal family. Thank you Lougopal for this great post. until martial law came and looted the place. until manila mayor lito atienza destroyed this landmar. until politics sticks its ugly head for evil money. Thank you for adding my renderings to this site. I do have to research a lot and imagine how the feeling and environment was during the glory days of Jai Alai Manila. It sure is heart breaking to learn this building was torn down instead of restoring it! Godbless! Your artistry is beautiful and certainly adds so much to our history of the Jai Alai. Thank you !